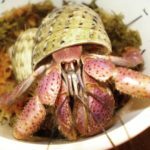 There is a webpage I ran across with a top 10 best hermit crab habitats (for purchase) and #1 on their list looks very bad (the crabs will die if someone comes across this page and buys this for a home for their crabs) This was just published on March 11, 2019. I found their email at the link below. I thought if enough people wrote to them, to get the false information off the page (or specify the first product shown is NOT to be used as a permanent home but a temporary cage for transportation to another cage, while cleaning etc) it might help save someones crabs from an early death. I haven't even looked much at the other 9 because I was so disturbed by this. I looked at the site and there are some things on there aside from the trash products that are considered safe such as the Fluker’s Beach Sand substrate, the cocohuts, the cholla logs, the Exo Terra tank (you just have to modify it for deep sub and seal the mesh lid), etc. They're making money off of people landing on their page and clicking on the buy on Amazon buttons. Also getting revenue from the copious amount of ads. It has nothing to do with pet keeping and everything to do with $$$.